Posted December 16, 2015 by oceanoracle & filed under Seashells. 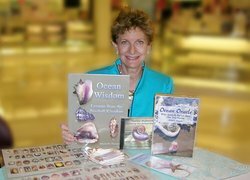 If you have been reading our blog, you will have an idea of all the ways that seashells affect our lives. Seashells provide us with a watery Magic 8 Ball that we can shake our questions at and receive answers. They also give us a suit of armor that we can wear during life’s many storms, protecting us in our time of need when the world is beating against us, trying to get us to engage in unhealthy jousting, just doing all it can to get us off our horses. 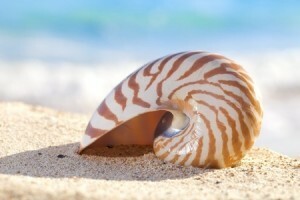 Seashells stabilize us and for that, we thank them. Stability. Now that is something we all can use during the hustle and bustle of the holiday season. These months it is hard not to feel as if you’re a leaf blowing in the wind, going from this store to that store, going from this gathering to that gathering. It can all be very dizzying. Sometimes it is best to just sit down and take it all in. Considering what seashells represent, wouldn’t it be nice to sit with one? Well, now here’s your chance, courtesy of furniture maker Marc Fish. He was inspired by the sea, the beauteous stability of the seashell. Since that initial project, he has made seven seashell tables. This seashell furniture gave him some direction in life after he had been wandering from job to job. In his words, “I learned about the need to constantly question your work. Everything has to be considered, every shape and every curve and every edge.” That first piece of oceanic furniture he designed is what skyrocketed his career into the stratosphere. Marc Fish is using the Nautilus as his inspiration. 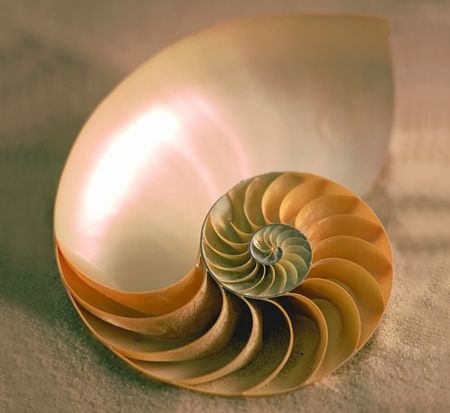 The Nautilus is very significant in seashell divination. I devote an entire class to the Nautilus, and even created a guided mediation where you journey inside the Nautilus shell. Below you can see why the story of Marc Fish is so powerful. As the young nautilus grows, its body no longer fits the dimensions of its chamber. It seals off that chamber and creates a larger one. It does this repeatedly until it achieves adult size. 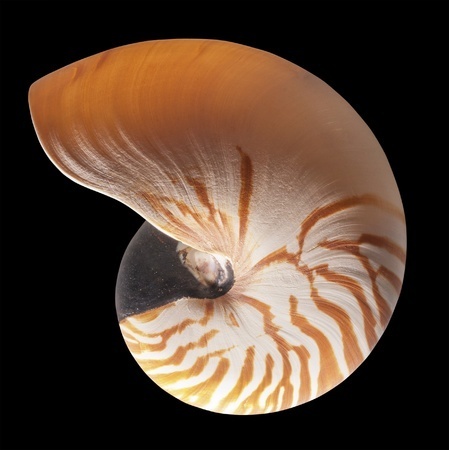 Throughout its life, the Nautilus only occupies the newest, outermost chamber during each progression of its shell. However, it remains connected to all the previous chambers through a tube called a siphuncle. Courtesy of the siphuncle, the nautilus is able to control the amount of gas and fluid in the previous chambers allowing them to function like ballast tanks in a submarine. By altering the volume of gas and liquid in those chambers, the nautilus is able to control its buoyancy (In his book, 20,000 Leagues Under The Sea, it is no coincidence that Jules Verne named Captain Nemo’s submarine the Nautilus.). Although at first blush, the chambers seem to be walled off, the siphuncle actually connects them all to the animal. In seashell divination, the Nautilus represents situations in our life where we closed the door and walked away from something. We discover a pattern where the faces may change, but the same situation follows us. Each time, the circumstances are one-upped so that it becomes harder to close the door and walk away from our emotions. This mirrors the Nautilus with its progression of ever larger chambers…. By the time we reach the largest chamber in our pattern, we are not just reacting to that circumstance, but to all those we thought we had left behind us. In fact, we may over-react because the experience triggers all the other buried times we walked away. Even when we hide something in our subconscious, it still impacts our life. You might say that Nautilus provides the buoyancy to allow the buried emotions to surface. Through awareness, Nautilus grants us the opportunity to stop closing the door and to confront the situation. The gift in this is that when we heal the current situation, we also heal the pattern and do not draw that situation into our life again. Marc Fish shared that he was drifting from job to job. He probably closed the door each time and moved on without another thought. Eventually, this pattern may have one-upped to the point that it disturbed him, and he may have started questioning his life. Moving on from that final job may have triggered the buried feelings of all the other times he changed jobs, and motivated him to find a job that gave him fulfillment. It is so amazing that his new job as a furniture maker would lead him to design a Nautilus table! It is funny to think that seashells from the depths of the ocean can take us soaring into our dreams above. Life isn’t without its little ironies, that’s for sure. Marc’s life and the path that it took is a testament to the empowering strength of seashells. Marc Fish assists us with sitting by a seashell, but we can even take this another step. In addition to sitting with a seashell, imagine living inside one. Here is a link for an entire house shaped like a Nautilus shell, http://www.beautifullife.info/urban-design/living-in-a-shell-nautilus-house/. While we are on the subject, On the Isla de Mujeres in Mexico, there is a house shaped like a Conch shell, http://www.isla-mujeres.net/shellhouse/. Strength and change like that is why we put seashells on a pedestal, up to our ears so we can listen to the sounds of the ocean. They are a connection to the bigger picture, like when dialup internet first made its appearance in the American home. However, it’s more spiritual than that – almost as if God or some other divine power puts a remote control in our hands and asks us to change the channel on the world so we can learn more about everything around us. Seashells, like animal bones discovered deep in the dirt, can provide us a bird’s eye view into the machinations of the secret history of the world, like how animal bones due to the efforts of archaeologists are shedding light on the lifestyle of citizens in ancient Maya cities, as discussed in this Ancient Origins article. This reminds me of the earliest cave men remains found in interior France. They were discovered with seashells. Scientists speculate that the shells must have come from other humans living near the ocean and a sort of chain of trade allowed the shells to end up in the interior of France. That indicates how much the shells were valued even at the dawn of our history. Archeologists have since used shells to establish the trade routes of our ancestors, or as clues to the climate of a certain era as well as how the shells were utilized as tools. That is a large amount of animal remains – all 22,000 of them! Scientists and archaeologists are salivating at the mouths to dig into this collection. It’s strange to think that these tiny little bones can open up a completely new world of Maya knowledge, that because of animal bones, we are able to determine the kind of lives that the Maya middle class lived. Perhaps the bones of long ago animals are trying to tell us something important, similar to what I do with seashells at Ocean Oracle. Obviously, we are at the precipice of much change in human history and the more we know about those who came before us, the more we will be able to deal with the upcoming changes. Animal bones and seashells, you could say, are a type of armor we wear on our minds and souls – so nothing, not anything, can break us down, so that we have enough energy and gumption to live the lives we have always wanted to live. Now isn’t that the REAL message of the holiday season?